Creative is a proud owner of a Half Round Seamless Gutter Machine. 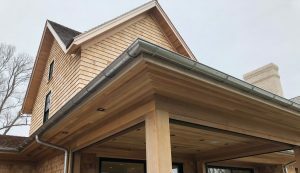 This allows us to create a seamless gutter that is custom fit to your homes dimensions. All of our gutter installs are custom measured and installed on site to ensure a perfect fit. When choosing your half round gutters choose from aluminum, copper, galvanized and lead coated copper. Our aluminum half round gutters are available in many different colors. Then choose either a 3” round or 4” round Downspout. We always recommend going bigger and choosing the 4” downspout. Half round gutters have been around for decades and have become greatly popular here on Long Island. Half Round gutters have been around for decades because of their Round-Downspout strength and corrosive resistance. Heavy gauged steel hot dipped with zinc gives the gutters added strength and resistance to the elements. Half Round Gutters also come in your choice of colors, add matching round downspouts for a beautiful addition to your home. Galvanized gutters look great and are typically less expensive than copper gutters. Homeowners that get galvanized gutters love the steel’s ability to retain its shape after a storm or any other kind of incident. Half Round Gutters do not dent easily and they retain their sharp lines and great look for years. The reason galvanized gutter repair calls for the services of an expert is that the repair process involves a technique called “soldering”. This is a technique in which two pieces of metal are joined together by melting them with another metal to form a strong bond. The skilled professionals at “Creative Siding & Seamless Gutters Inc” can handle these complicated jobs. Installing and properly maintaining galvanized gutters is definitely not a project for an inexperienced homeowner. It will take the skill of a professional to ensure that your gutters are properly installed and maintained at all times. 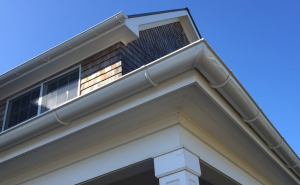 Galvanized gutter repair is not a do-it-yourself job, as the process is complicated and requires the skill of a trained professional in order to have the task completed properly and in the safest manner. Our gutter repair experts have been trained to meet both technical and safety standards. If you want the durability of metal gutters, at a reasonable price, then look into having galvanized gutters installed. These kinds of gutters look great when painted and can last for years when maintained properly. Be sure to leave the installation and maintenance work on your galvanized gutters to “Creative Siding & Seamless Gutters Inc” to make sure that your gutters last for a long time. If you have any questions please contact us at (631) 737-0811 we would be more than happy to assist you.